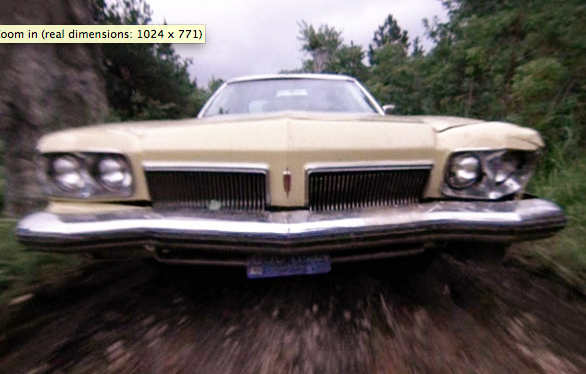 EVIL DEAD: Is That Sam Raimi’s 1973 Olds Delta 88? In “Evil Dead“, the 2013 remake of Sam Raimi‘s cult classic, “The Evil Dead“, is that the director’s iconic 1973 Oldsmobile Delta 88 sedan lurking in the woods? The answer is “no”. But the filmmakers would like to trick you into thinking it might be the “Classic”. They even have given it a broken left headlight. The biggest clue that this is not THE Delta 88? It is the wrong year. While there is no question Raimi’s Delta 88, which appeared not only in the original movie but also had a cameo appearance in his 2002 film, “Spider-Man“, was a 1973 model…the one seen in “Evil Dead” is a year newer. As the Deadites Online website points out, the original 1973 model, purchased new by Raimi’s father, has actually turned up in just about every film Raimi has ever made. But “Evil Dead” is a game-changer. Literally. Keep an eye out for the differences between the front ends. EVIL DEAD Olds: Check out the front end. A 1973 Olds Delta 88 had a hood that curled down over the front of the car. Under it, two low, long and wide “waterfall” grille sections were placed either side of a “nose”, festooned with an Oldsmobile logo, about six inches wide. The front bumper ran in a clean, unbroken line across the front of the car. In the “Evil Dead”, the grille sections of the rotting Olds in the woods are placed much farther apart from the nose. They are more upright and square. In fact, they begin to wrap up over the hood line. And the front bumper of the car in the remake has two bumper guards, while Raimi’s did not. See also the chrome “Oldsmobile” script on the left grille panel; not there in a ’73. In “Evil Dead”, we’re looking at a 1974 Oldsmobile Delta 88. Maybe we’ve misunderstood this whole Evil Dead thing for the last 30 years. What if the demons are actually targeting owners of Oldsmobiles? No wonder the company went out of business. That’s o.k. if the Olds is one year off, at least they tried. Maybe the director wanted to make it his own, just a little bit. It could be worse and they used a totally different car. Sam Raimi’s Olds Delta 88 has been in nearly every film of Raimi’s career. A Simple Plan, Crimewave,The Gift,Darkman,all 3 Spider Mans, all 3 Evil Deads,Drag Me To Hell plus it was in the Coen Brothers’ films Blood Simple, Fargo,Raising Arizona and The Big Lebowski.This particular car has had an interesting life. Since Raimi produced the 2013 Evil Dead I would expect him to put the car in there.If it wasn’t his then they tried to make it look like the 88 just because of the mythology of Raimi’s 88. Aside from this I’m saddened by the remake of Evil Dead. Terrible film and probably one of the worst endings in history. Just a complete and utter letdown from the start. And just at the times you think it’s about to redeem itself they just pop the bubble. If you take out the “Book of the Dead” and the title Evil Dead there isn’t really anything else related to the original.And the entire part of the original of how they find the Book and the recordings explaining the book and the professor’s wife buried in the fruit cellar!? Man they just wiped all that away.Really surprised Raimi associated his name with such an awful script and equally awful movie. Your fellow moviegoers seem to agree! In “A Simple Plan” a Delta 88 can be seen on the side of the road parked. A lot of people has pointed this out. It is a 1981 Delta 88 and is obvious by the tail light assembly and bumper. While it is very true that for the most part a 1973 delta 88 was used the 74 in the new movie I suspect was to pay homage to the movie. Personally I think it was just the closest model they could find at the moment to put in the movie. But yeah the one in the movie “A Simple Plan” was not the “Classic”. It was probably the only one that was on hand at the moment. So the idea Sam only used a 73 Delta 88 in his movies is incorrect. You also got to remember that the Delta 88 of that year has different trim options Royale is a bit different and the convertible model is a little different and the 2 door coupe is a bit different. But the script is present in both 73 and 74. So thats why I give the makers a pass on the car in the movie because they got it a hell of a lot closer than “A Simple Plan” which is one of Sam Rami’s films. I’m in Thailand right now, but if I get back to the states I would definitely pick up a yellow 1973 Oldsmobile Delta 88 – just as an inside joke or for “movie memorabilia street cred” – if anyone even cared…but I might deck it out in that special Tiffany 1972 anniversary edition interior from the Olds 98 – just cuz it was Soooo plush ‘n comfy…this would be the way to go for sure! Loved the “loose pillow” sofa look seats. How they must have aged.